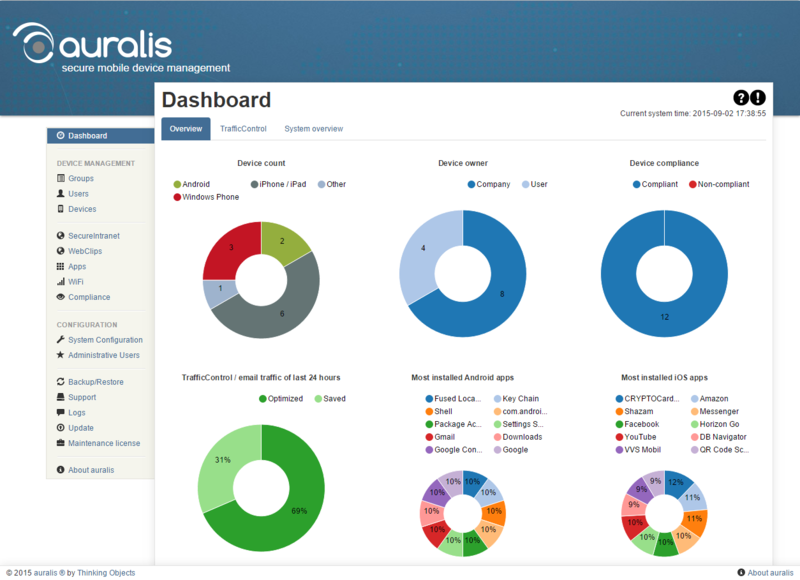 auralis® is your Mobile Device Management solution for Apple iOS, Samsung Knox for Android & Windows Phone. 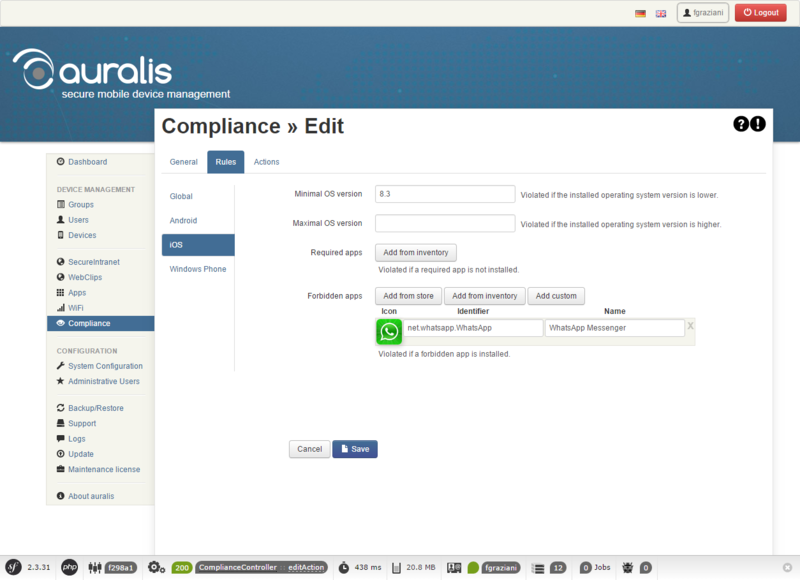 Now you can easily control and manage all mobile devices in a user-friendly administration interface. 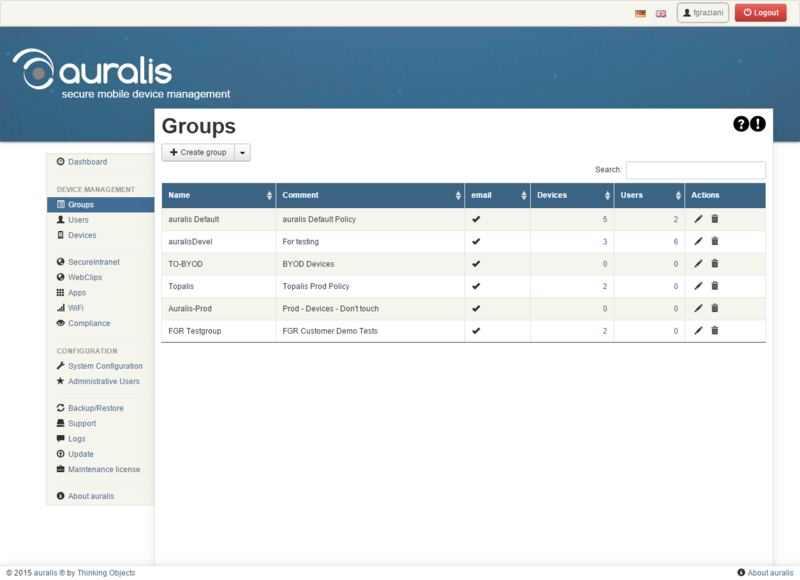 Create different policies for different groups directly and simply in the Web interface. This will enable you to enforce central password policies, restrictions, and hand over Wi-Fi settings, for instance. The profiles are transferred using the push procedure operated by the manufacturers. You can see how many mobile user devices of what type are connected to your company, and who the owners are. Was it procured by the company, or is it a BYOD smartphone or tablet PC? Have you defined compliance rules, and are there any devices that breach these these rules? Everything at a glance! You can also see initial statistics for the installed Top Ten iOS and Android apps, and the most recently active devices. Our unique email compression solution TrafficControl has its own tab. Here you can see detailed statistics, right down to the file type, on how much traffic you have saved. Instead of creating huge numbers of individual profiles and assigning them to single devices, with our mobile device management solution you can simply take care of everything in a few groups. With the group-based configuration you will get to your goal more quickly. All the settings for iOS, Android and Windows Phone are mapped in one group. If necessary, you can create different groups for the marketing, sales, and IT departments, etc. The global settings, such as APP mappings, Wi-Fi profiles, Web clips, and compliance policies, can be comfortably activated in the group settings. Even our email compression solution can be individually configured for each group. Our Mobile Device Management solution has an integral user management module, in which all the smartphone users are maintained. 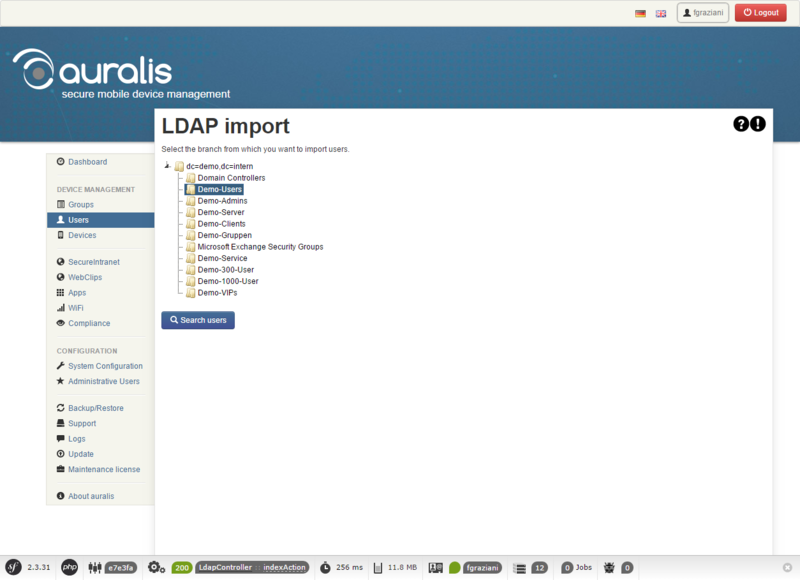 However, you still have the possibility to import them via an LDAP interface. Regardless of OpenLDAP or Microsoft Active Directory. Browse through the OUs and select the users you want to import. If you want to roll out a device for the colleagues, you can create a device as well at the same time. With this interface, it will take you just a few minutes to create all the smartphone users, and you can begin with the rollout. A clearly laid out list of all the registered devices lets you quickly find the ones you are looking for. 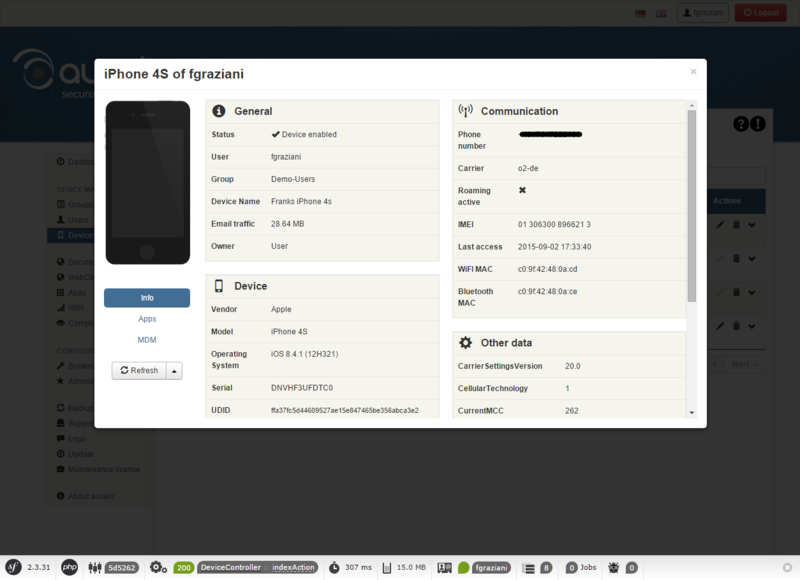 All the details are displayed in the device properties. Including the installed APPs or compliance breaches. If a smartphone or tablet PC gets lost or is stolen, you can quickly perform an enterprise wipe or reset the device to the factory settings. This will enable you to prevent the data on the user device from falling into the wrong hands. If you are running an asset management system, you can export all the information and link it to your system via a standardised authority. Since you can’t prevent or stipulate everything, it’s important to monitor devices for certain characteristics. And that is precisely what the compliance rules of our Mobile Device Management solution take care of. Are you blocking any apps, but the app store should still be available to everyone? Do you want to have the latest version of the OS installed on all the devices? Should roaming be activated for your end users? It is exactly these aspects which are checked and assigned actions where necessary. For example, removing the mail account for failing to comply with the policy until the device fulfils the specifications again. This will ensure that all the devices meet your compliance requirements at all times. Does that sound familiar to you? Everyone wants to know the Wi-Fi password for his or her smartphone. Once the devices are connected to our Mobile Device Management solution, this is no longer necessary. 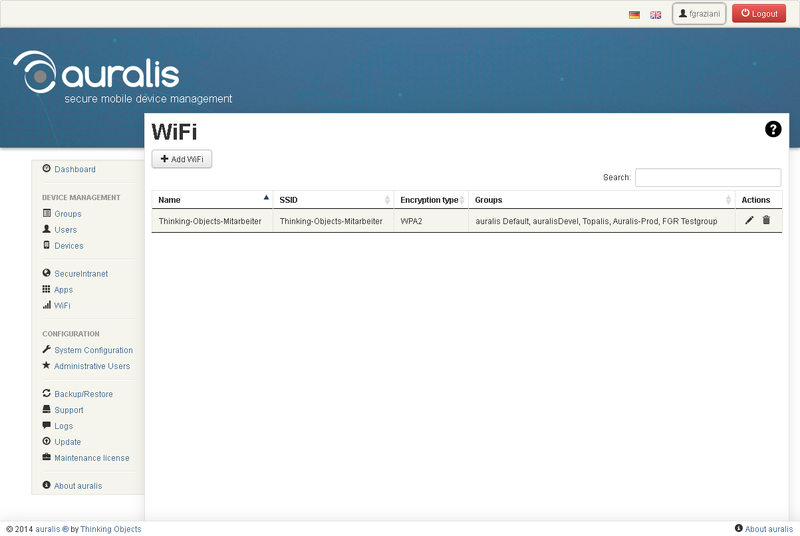 Simply store all your Wi-Fi networks and activate them in the group configuration. When a smartphone is within range of one of these wireless networks, it connects to it automatically. Even password changes are no longer a problem. Just replace the key, and it is rolled out on all the smartphones and tablet PCs. Number of unique passcodes before resuse. Implement your BYOD (Bring Your Own Device) policy without losing control over data and content. Thus your user can securely use their favourite mobile devices within their working enviroment. In case of loss or theft of an smartphone oder tablett, just start a remote wipe that makes the data on the device inaccessible within seconds for any attacker.